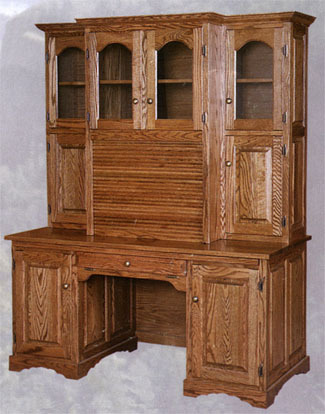 Just one look and you’ll fall in love with this beautifully crafted computer hutch featuring plenty of storage space, and a classic roll-top area for your computer. Sturdily built of solid oak, with detailed panels, fine moldings and glass fronted doors, this desk doesn’t just keep you organized, it makes your room look great too! There is a full modesty panel for the ladies, and the center drawer flips down for keyboard access. What more can you ask for in a desk? You will also notice that just above the keyboard drawer and bottom cabinet doors that there is a pull out work surface the entire width of the desk. Please note this desk has been revised, and we don’t yet have a new picture of it. There is no longer a full-width shelf right under the desktop as shown - the manufacturer determined that the design was too stressful on the desktop, and revised the desk so there are now two of the more traditional pull-out shelves - one on each side above the cabinet doors.